This week we highlight some fresh new chamber music, and a world premiere recording of the Italian 1774 version of Orfeo ed Euridice by Gluck. If you are interested in the journeys works of music can go on, we also have a 2015 recording of this work, being the 1762 version (in Italian), with highlights from the 1774 Paris version (in French). Orfeo ed Euridice, Gluck. Performed by Philippe Jaroussky, Amanda Forsythe with Diego Fasolis, conductor. “A sumptuous world-premiere recording of Gluck’s masterpiece of operatic reform, as it was presented in its Naples premiere at the Court Theatre of the Royal Palace in February of 1774, several months before the pastiche version with expanded cast debuted at the Teatro San Carlo. Here the work retains the intimate three-role cast of the well-known 1762 version, yet with fascinating customisations: the title role’s melodic line reshaped for a male soprano, a substitute aria offering a penetrating psychological portrait of Eurydice. In all, the genius of the work shines with new, astonishing colour, taking on a peculiar pace and unexpected brightness.” (cover). Quatuor a Corde, Op. 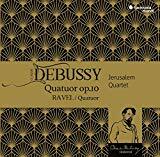 10, Debussy, and Quatuor a Corde, Ravel. Performed by the Jerusalem Quartet. “A century after his death on 25 March 1918, many harmonia mundi artists are eager to pay tribute to Claude Debussy, the magician of melody and timbre, the great ‘colourist’ and father of modern music. 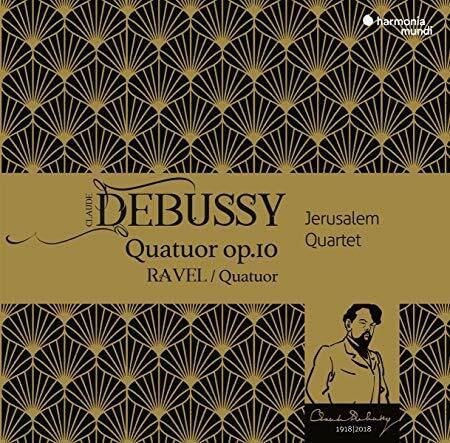 The musicians of the Jerusalem Quartet offer a new reading of his only String Quartet, in the logical coupling with its Ravelian counterpart: in some respects, the two works might seem like twins – and yet what differences there are between them!” (cover). Oktett, Franz Schubert. Performed by Isabelle Faust and other string and wind performers. “In response to a commission from Count Troyer, who wanted a work closely modelled on Beethoven’s famous Septet, op. 20, Schubert – despite his fervent admiration for the older composer – resolutely struck out on his own way by delivering an… octet. While the enlarged forces opened his path towards symphonic writing, examination of the form and expression reveals a much more accomplished and personal composition than has generally been recognised by commentators. 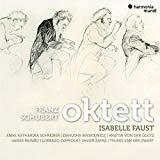 Isabelle Faust and her partners, enthralled by what is an exceptional work in every respect, offer us a new interpretation of it on period instruments.” (cover).